Your 2019 American League East division champions will be the New York Yankees, at least according to the latest batch of PECOTA projections for this upcoming MLB season. PECOTA -- which stands for 'Player Empirical Comparison and Optimization Test Algorithm' -- is a system designed by Baseball Prospectus used to forecast individual and team success based on past performances measured against luck-based outcomes. The annual projection system shows a 96-win season for the Yankees, good enough for a six-game lead over Boston and a division title. Of course, these projections are merely well-informed estimations as to how teams might perform, but actual results may vary (obviously). Still, Yankees fans will be happy to know that the advanced metrics are in the Bombers' corner. On top of an AL East title, PECOTA foresees a whopping 810 runs to be scored by the Yankees, good for the MLB lead. Only one other team, the Houston Astros (805 runs), are projected to clear the 800-run threshold, but Red Sox fans will likely have something to say about that. Looking even more closely at PECOTA's estimations, we see a number of Yankees hitters projected to put up big power seasons in the Bronx in 2019. The quartet of Luke Voit, Gleyber Torres, Miguel Andujar and Aaron Hicks also projects for 20+ homers this coming season, giving the Yankees a real opportunity to break their own MLB record of 267 team home runs, set this past year. On the pitching side, PECOTA forecasts good signs for the top of the rotation as well as several relievers, though no starter is expected to pitch more than 200 innings. That may not be a huge concern, however, considering the depth and talent of the Yankees bullpen. As Hal Steinbrenner recently said, the Yankees roster heading into 2019 looks to be more talented and perhaps a bit deeper than the one with World Series hopes in 2018. Games are obviously played on the field, not on paper, so there's a lot that will happen between now and Game 162. There's also a couple of marquee free agents that could shift the PECOTA projections, but it's impossible to know where they'll end up or how they might influence division races across the league. Only time will tell where the remaining free agents will settle this offseason, but even if the Yankees don't make any more roster additions, they can match up with any team in the league and should hope to contend for another World Series title this year. Stay tuned to YES Network for the latest news and developments as the 2019 season gets underway with the start of Spring Training next week. 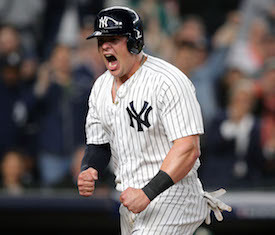 For the full list of the Yankees' 2019 PECOTA projections including all active roster members, visit the link here.